Consuelo "Chit" Lijauco, Managing Editor, Philippine Tatler, Philippines. Elvie Abordo, Vice President, Rockland Ambulette Service, Inc., New York, USA. Fritzie Igno MD, Associate Medical Director, The Queen's Medical Center, Hawaii. M. Evelina Galang, Director of Creative Writing, University of Miami, Florida, USA. Builders have demonstrated exceptional business impact at a large workplace environment; displaying deep passion for a cause through collaborative initiatives or alliances with nonprofit organizations on behalf of her own organization; demonstrates high potential and skill with measurable results at a government agency, or organization in the public and private sectors. “Buildership” is about building better organizations, leading broken organizations to adjust, repair, and re-align. Aida Garcia, Esq., Lawyer and Registered Migration Agent, Filipino Communities Council of Australia Inc., Australia. Carmen Lamagna Ph.D., Vice Chancellor, International American University - Bangladesh; International Association of University Presidents. Filomenita Mongaya-Hoegsholm, M.Sc./Diplomate, Founding Chair and International Liaison & Coordinator, BABAYLAN, the Philippine Women's Network, Denmark. Judy Arteche-Carr, Chair Emeritus, Society for Information Management, New York, USA. Ma. Rhodora "Ayhee" L. Campos, Country Head-Philippines, Infosys BPO Ltd., Philippines. Marianne Hontiveros, Chair and CEO, AirAsia Zest and AirAsia, Inc., Philippines. Marie Claire Lim Moore, Asia Pacific Regional Director of Global Client Banking, Citi, Singapore. Marilyn "Wafa" Roscales-Kasimieh, Senior Advisor, Islamic Affairs Charitable Activities Department, Government of Dubai, UAE. Mary Ann Covarrubias Ph.D., Vice President of Academics, St. Mary of the Woods and School of Mount St. Mary, Bulacan, Philippines. Milagros Sering, COO / Senior Managing Director for APAC Sales & Marketing, Seven Seven Global Services, Inc., USA and the Philippines. Myrna Obligacion Carreon, Founder, Asian/Pacific Employee Resource Group-American Airlines, Texas, USA. Nora Kakilala-Terrado, Undersecretary, Department of Trade and Industry, Republic of the Philippines. Olivia Valera Palala, Philippine Ambassador to the Hashemite Kingdom of Jordan. Sarah Songalia, Founder, Burublig Para Ha Tanauan, Philippines. Zenei Triunfo-Cortez RN, Member of the Council of Presidents, CNA/NNOC; Vice President, National Nurses United; Founding Leader, Global Nurses United; California Nurses Association, National Nurses United, Global Nurses United, Staff Nurse IV, Kaiser Permanente, USA. Janice Lao-Noche, Sustainability Manager, MTR (Mass Transit Railway) Corporation, Hong Kong, China. Melissa Ramoso, Deputy District Director, CA State Senator Ted W. Lieu, California State Legislature, USA. Analisa Balares, Chief Executive Officer and Founder, Womensphere; Womensphere Foundation, New York, USA. Angelica Berrie, President, Russell Berrie Foundation (RBF); CEO, Kate's Paperie; CEO Angelica Berrie Foundation; former CEO, Russ Berrie and Co., New Jersey, USA. Catherine Feliciano-Chon, Managing Director & Founder, CatchOn & Company Ltd., Hong Kong, China. Conchita "Chit" Bathan, CEO, Core Tech International Corporation; Member, Guam Land Use Commission and Guam Seashore Protection Commission, Guam. Darlene Marie Berberabe, Esq., President and Chief Executive Officer, Pag-IBIG Fund, Philippines. Edith Villanueva, President and COO, Sugar Industry Foundation Inc. (SIFI), Philippines. Karen Batungbacal, Executive General Manager, QBE Group Shared Services Centre, Philippines. Ma. Victoria Añonuevo, Managing Director and CEO, Millenium Challenge Account - Philippines. This award recognizes women who have broken new ground in the global workplace, have delivered new and unique applications of emerging technology transforming the way people think, in the fields of sports, literature, the arts and pop culture, or have improved the lives of others by helping develop a product or service in the fields of science, technology, engineering, arts, or mathematics. This award category is also for someone who have either launched a new enterprise, a learning function, or completely overhauled an existing development or community initiative that has sparked a following. Boots Anson Roa-Rodrigo, President and Trustee, MOWELFUND, Inc., Philippines. Cris Comerford, Executive Chef, The White House, Washington DC, USA. Grace Princesa, Philippine Ambassador to the United Arab Emirates. Ida Ramos-Henares, CEO, Primeline Management & Production, Philippines. Jennifer Lopez Fernan, President, Pangea Green Energy Philippines, Inc., New York, USA. Maria Lourdes (Marides) Fernando, MPS, President, River Star Food Group & Affiliates; Chair, Galing Pook Foundation; Director, BF Corp; President, College of Arts & Science of Asia and the Pacific, Inc.; former Mayor of Marikina City, Philippines. Maria Ressa, CEO & Executive Editor, Rappler, Philippines. Patricia Espiritu-Halagao PhD, Hawaii State Board of Education, Hawaii. Teresita Pullin (Tessie Tomas), Actor, Comedienne, GMA Broadcasting Corporation (GMA 7), Philippines. 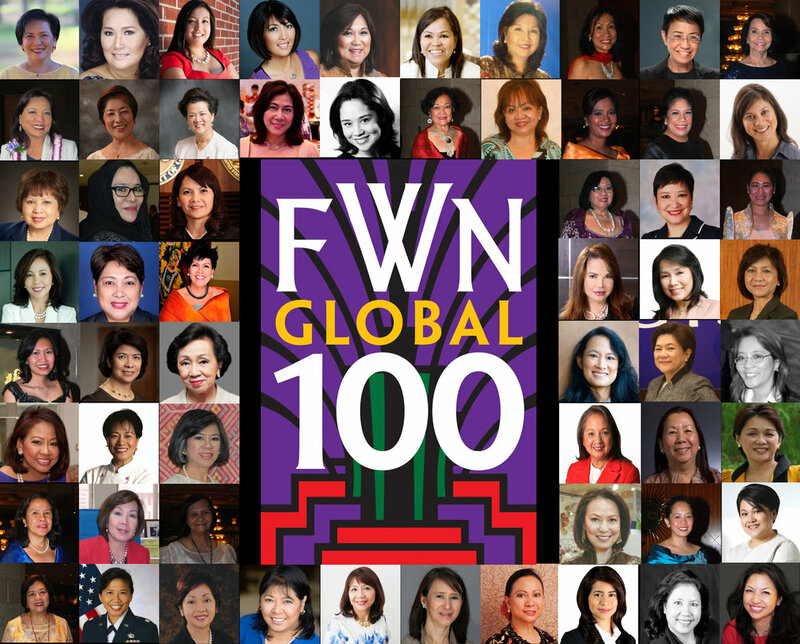 This award honors Filipina women whose words, actions, and activism, inspire others to act and revolutionize society’s way of understanding traditional beliefs and customs thus leaving behind a Filipino global imprint. “Nicole,” who sparked an international dialogue about women’s rights, national sovereignty, and international law, as she steadfastly pursued justice against her rapists, inspires this category. Delia Rodriguez-Amaya, Ph.D., Professor, Universiy of Campinas, Brazil, President, Int'l Academy of Food Science and Teachnology, Brazil. Maria Castañeda, Secretary-Treasurer, 1199 SEIU United Healthcare Workers East, New York, USA. Maria Teresa Bonifacio Cenzon, Superior Court Judge, Guam. Rida Cabanilla, State Representative, Majority Floor Leader, House of Representatives, Hawaii, USA. Ruth Uy Asmundson, Ph.D., Ambassador to Davis Sister Cities, City of Davis, California; Special Assistant to Vice Provost of Outreach and International Programs, University of California, Davis, USA. Thetis Mangahas, Deputy Regional Director, Policy and Programmes for International Labor Organization Asia Pacific, Thailand.